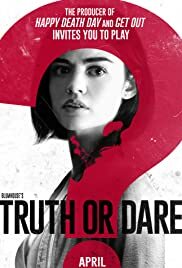 The film title is not Truth or Dare but BLUMHOUSE’S TRUTH OR DARE. With reason! The game played is a Blumhouse, the film horror company’s version of the game in which players will die a very violet death if they do not tell the truth or do a dare. In Mexico, they stumble across a missionary ruin and coerced into playing Truth or Dare by a stranger, Carter (Landon Liboron). When it is his turn to play, Carter reveals the real truth he is there with the group – to force them into playing with death involved. Of course they disbelieve him, till the gang starts dropping dead one by one when they do not follow the rules. Jillian Jacobs, Chris Roach and Jeff Wadlow) has quite a few inspired twists. The group or in this case, Olivia the heroine has to figure out the way to remove the curse and to halt the game. The film’s ending is too ambitious for its own good an ends up being an unbelievable let-sown, judging from the response of the audience at the promo screening. The film follows a few general rules of the typical horror film. The corky self-centred assholes are the first to go. All the deaths are gross enough, with the audience at the promo screening gasping aloud. There is more character development in this film and when one of the victim dies, some of the audience is actually brought to tears. This is a rarity in horror flicks – and a good thing. The film also contains a brilliant anti-message. Olivia is told off by her friend, Markie to stop thinking about others and to start thinking about herself (in order to survive). The young actors are all believable enough as party animals brought to their senses. The best actor of the lot is Canadian Hayden Szeto who brings his gay Canadian character, Brad to life. He was last seen in EDGE OF SEVENTEEN. One flaw in the plot is his character saying that he is studying in the States to be away from his father though his father turns up as a cop in the U.S. where he is studying at college. Another is the absence of the characters’ parents except for Markie’s and Brad’s. I have never known any Asian to be called Brad. Blumhouse has made three box-office and critical successes with SPLIT, HAPPY DEATH DAY and the phenomenal GET OUT. BLUMHOUSE’S TRUTH OR DARE seem to have got the lowest rating so far of the four films on Metacritic. The reason is that the film has more story and character development than the average horror flick with no false alarms or cheap jump out of the seat tactics common to films of this genre. Horror fans do not like their horror formula tampered with. Still this Blumhouse film which cost $3.5 million to make is estimated to draw $15 million at the box-office which will make it as another successful Blumhouse film.